Labonte vs. Earnhardt. Gordon vs. Wallace. Kurt Busch vs. Jimmy Spencer. Kyle Busch vs. pretty much anyone since 2007. 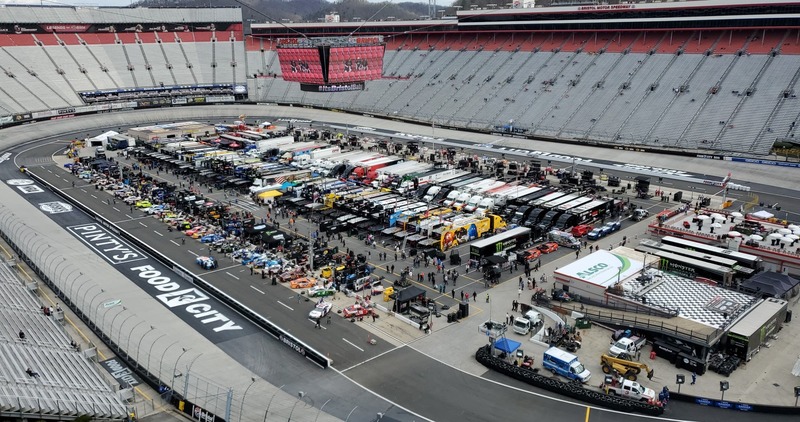 Truth be told, Bristol Motor Speedway is where all the action and frayed tempers happen so quickly, a minute of action nearly equals five laps! Don’t blink too slowly as you may miss the trouble out ahead of you. 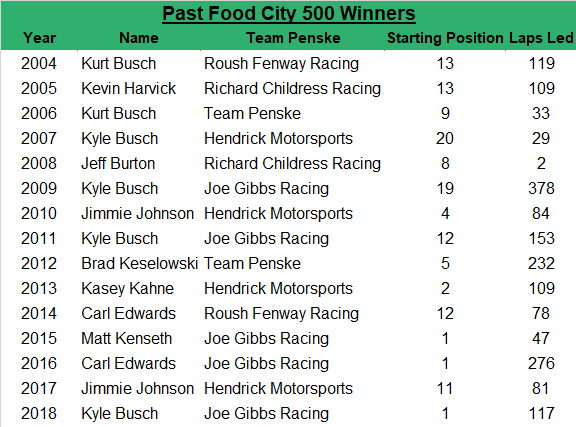 In a season that’s been so far dominated by Joe Gibbs Racing and Team Penske, Bristol offers somewhat equal footing for other teams to shine! With at least 500 laps comes at least as many chances to turn your season around faster than you can say group qualifying. NASCAR is deliberating about the return of single car qualifying at tracks where the draft is a factor. 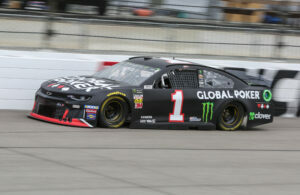 Should NASCAR implement this qualifying format as soon as possible to eliminate the games played during group qualifying this year? 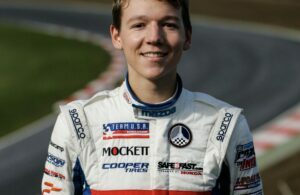 Bowman : I would love to see group qualifying come back to drafting strong tracks. However, I can see the argument for cost and risk for the teams coming up. I don’t know that you can really have two different sets of rules that are track dependent. Too many variables for this girl! Cassidy : Single qualifying formats brings added marketing opportunities to the sport. Drives, teams and sponsors should be able to soak up the fame for 2-3 minutes of airtime that solely focuses on what they are doing for the sport. Plus, with this aero package it seems like the most successful option. Hobbs : This question has gotten a lot of flack over the weekend. When drivers and commentators are making comments and laughing about what is taking place, something must be done. And that something must take place right now, this weekend. Qualifying rules based on track size will just add to the complexity of the sport. Just take it back to single car qualifying, each driver gets their time to put down the fastest lap, and call it a day. 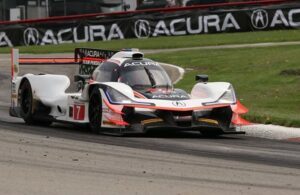 Lambeth : Based on the current aero package, it might make more sense to return to single-car qualifying for the tracks that include aero ducts. I am sure that drivers are tired of the silliness. When in doubt, common sense always prevails. Shoopman : Based on everything we’ve seen from group qualifying, as well as the driver feedback we’ve heard; I believe NASCAR should bring back single car qualifying as soon as they can. Qualifying the last few weeks has been quite frankly, a joke. It’s not being taken seriously, and it’s getting worse each week. Change needs to happen. Tiongson : I honestly see some kind of change happening for Kansas or Charlotte. At tracks where the draft is a factor, we’ve unfortunately seen more cons with group qualifying than in years’ past. With these cars losing nearly 200 horsepower, they’re reliant on the draft and drivers don’t want to be the first off pit road. 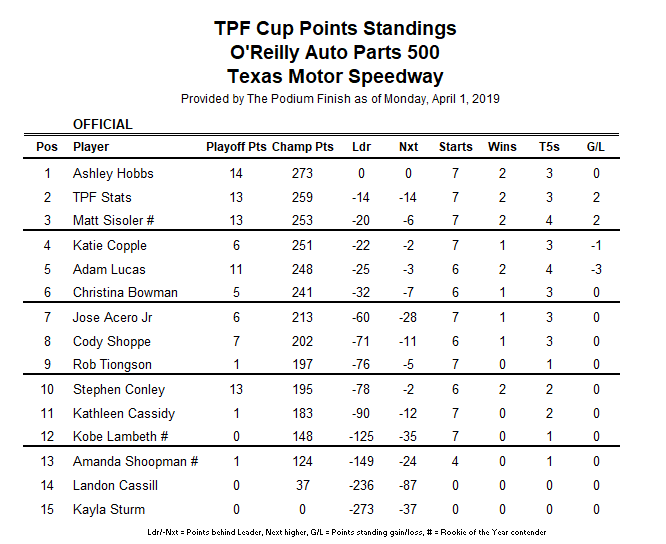 While we at least saw some efforts in the final qualifying round at Texas, we saw a lot of frayed tempers. It’s time to abandon this once entertaining format and be logical, as Spock would value. 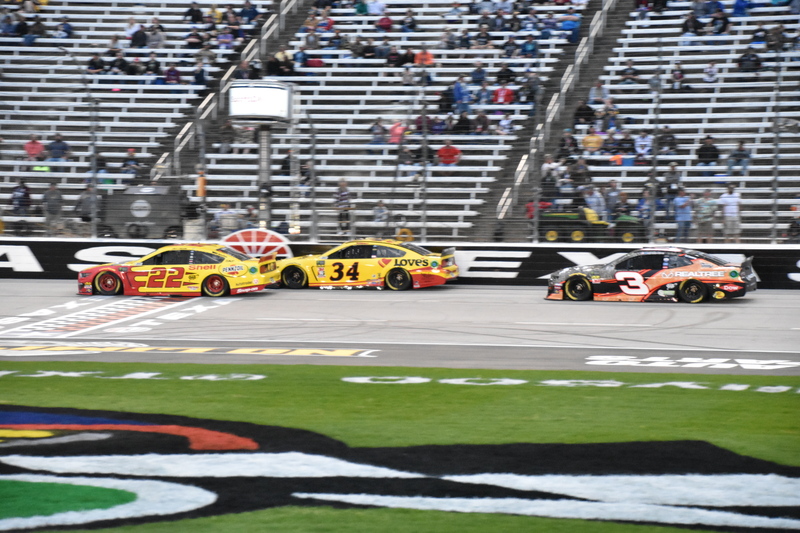 We saw some fairly competitive racing at Texas, particularly in the Cup race, as the leader could be caught. Was this a byproduct of the package, the track utilizing the PJ1 substance prior to the weekend, or both? Acero : I want to say it was a combination of both. We saw some side by side racing as well as people passing for position. Should PJ1 be applied on all tracks? Maybe maybe not. Now if only NASCAR gets the whole qualifying circus under control. Conley : All of the above. And that is a problem. As they try and figure out this new aero package and how things work,’along a combo platter like Texas really doesn’t allow for anyone to understand what worked best. But, as long as it put in a competitive show, that’s all that matters, right? Problem, it’s like a magic trick. It’s all an illusion…especially when you show up at Kansas, our next mile and a half. Copple : I think it’s a combo package here. This was the first race we could really see the new package in action, but we can’t just base the performance of that package on just one good race. Should PJ1 be something implemented going forward? To be decided, but I do think it’s something NASCAR should take into consideration. Any time a change is made and it makes a better racing product, it deserves a second, third and even fourth look. 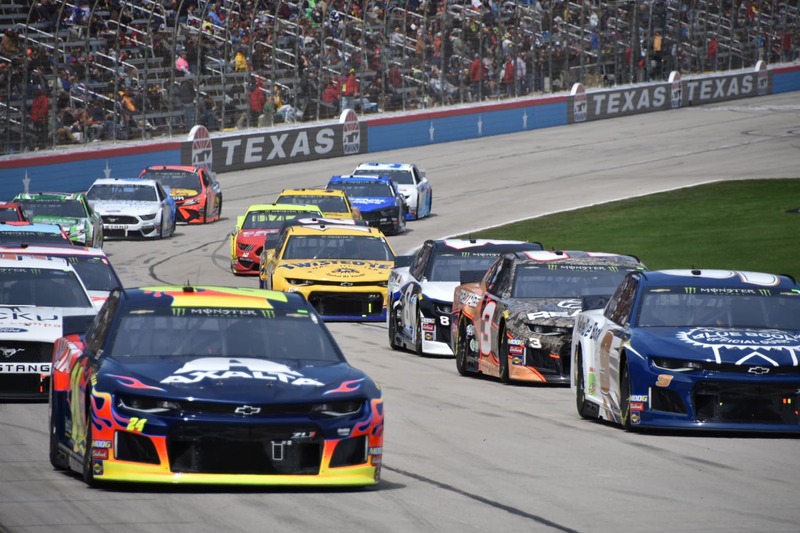 NASCAR’s goal should be to get the best racing product possible out on the track each weekend and the results of Texas should factor in to changes moving forward. Shoppe : This was the first race where the new package really showed what it was supposed to do! We saw the top five or six cars all nose to tail and weren’t just staying there either, but making passes! It was a competitive race and a fun one to watch throughout in comparison to most recent mile and a half tracks. Let’s hope this good racing keeps getting even better and continues to go in the right direction! Sisoler : It’s a mix of both honestly. Putting down that compound on the higher grooves allowed cars to go side-by-side, and that, mixed with the new package, made for some great racing compared to what we have been seeing at other mile-and-a-half tracks. I hope that NASCAR can keep the racing improving as 2019 rolls along! Two laps around Bristol can go by an instant! Now, it’s time to flash back to last Sunday at Texas! 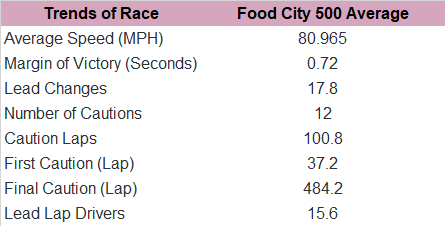 Let’s review our race and points reports! Cassidy was nearly right on with Clint Bowyer. In the meantime, Hobbs enjoys another week as our points leader. Of course, it’s not a true Podium Preview without considering statistics! So here’s Ashley Hobbs who’s Crunching the Numbers for the Food City 500! There’s some hope for the major Chevy teams. In the past 15 years, the average starting spot for the race winner is 9.3 while the average number of laps led by a winner is 123.6. The odds favor Jimmie Johnson. Bristol at a glance in its past 10 spring races. 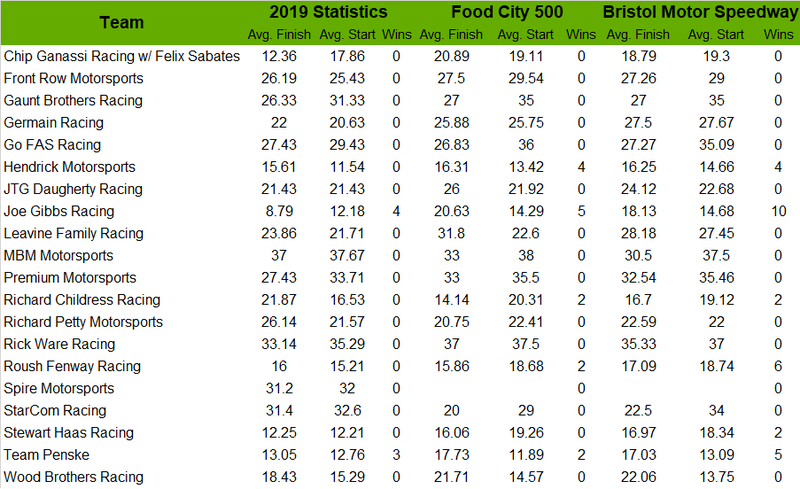 Trends at Bristol in its past five spring races. Last but not least, it’s the moment you’ve all waited for in our preview! With that in mind, let’s reveal our Food City 500 race picks! Acero : I have no clue. I guess I can go with Kyle Busch, as he has swept there before! 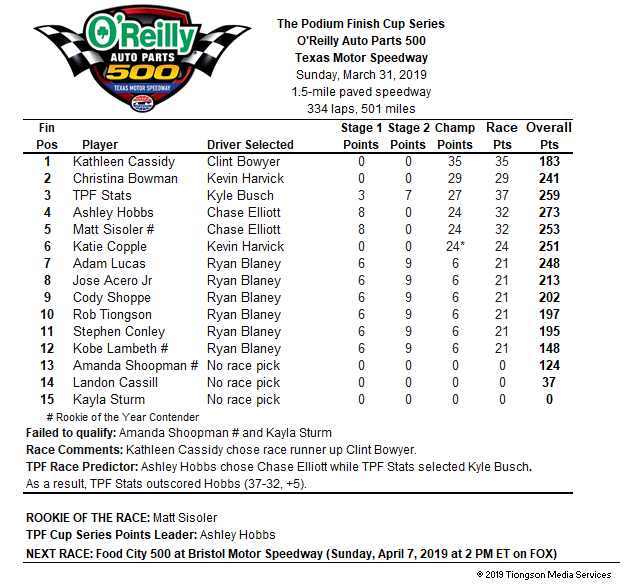 Bowman : Kyle Busch is on a roll! TPF Stats : It’s hard to count out the best man in the garage right now. Kyle Busch to get his third win of the season at Bristol Motor Speedway. Shoppe : Joey Logano will win at Bristol, maybe even the same way he won Martinsville last year! Copple : Do I have to pick? Um…Logano seems like a good bet at Bristol. Hobbs : Denny Hamlin is going to ride his Texas victory straight into the Great Colosseum that is Bristol Motor Speedway. Sisoler : It’s tricky to pick because Bristol is an absolute madhouse of a track, and we love it for that. Rowdy Busch might be on a roll for the Joe Gibbs Camrys, but I’m going to roll the dice on the next best JGR driver this season, at his home track no less: Virginia’s own Denny Hamlin gets his second Cup series Bristol win on Sunday. Lambeth : Kyle Larson is going to ride inches away from the wall and earn a much-needed victory at Bristol. 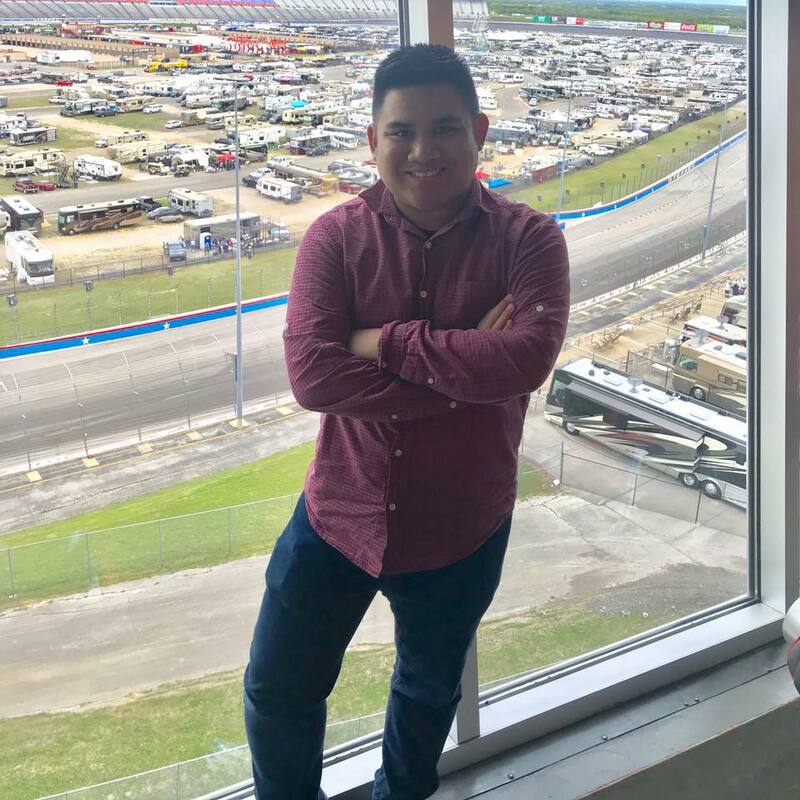 Tiongson : Believe it or not, I have to go with Kyle Larson. I know the 42 team isn’t quite showing its strength as it has in the past few years, but this is Bristol, he is starting likely on the outside lane, and we know how he loves that particular groove around the track! Conley : Hendrick Motorsports finally finds victory lane with Chase Elliott. Shoopman : I know I say this every week, but I just really want a Ryan Blaney win. Race fans, thanks for joining us for our preview of the Food City 500! Next Story → Was Bristol Empty or Was It a Matter of Perspective?